For advising, you can make an appointment with Dr. Leslie McLees through the online scheduler or attend drop-in hours. You can also contact her at geogadvr@uoregon.edu for a response generally within one business day. Drop-in hours from Spring 2019 are Wednesdays from 11:00am to 12:00pm. 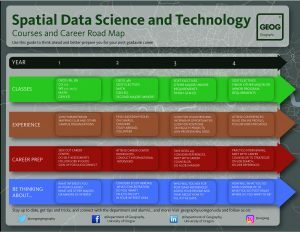 The Spatial Data Science & Technology major (SDS) requires a minimum of 48 credits in Geography and Computer Science. At least 9 courses must be taken for a letter grade. A grade of C- or better is required for any course applied towards the major, and a GPA of 2.25 is required in courses used for the major. There is no option for a minor with this program. All Geography majors seeking a B.S. degree will be required to complete any math sequence that satisfies the University’s math requirement for a B.S. degree. Math classes must be passed with a grade of at least C- or P. For students in the SDS major, we recommend a computer programming sequence. You can double dip courses between the SDS major and the requirements for a Bachelor’s of Science. A major checksheet summarizes the requirements. These courses will provide foundational skills, concepts, and critical thinking abilities. Some of the introductory courses, such as GEOG 481, are pre-requisites for more advanced courses. Students are not required to complete these before moving to elective courses (except where pre-requisites are required). Rather than adopting a series of specializations, the electives component will remain flexible. Students should meet with the Undergraduate Advisor upon declaring the SDS major to work out a series of courses that best fit student needs and employment aspirations. * Special Topics includes courses that will be offered less frequently but will also qualify for credit when offered under the course number GEOG 490. This includes Web Mapping, Server GIS, Qualitative Spatial Reasoning, and Spatial Simulation. ** Occasionally a course will be offered under the number 410, which denotes an experimental course. In the event that this course does count towards this major, it will be indicated as such on the course offerings sheet the term it is offered. Please confirm with the Undergraduate Advisor that an elective course will count towards your major requirements before registering. The SDS faculty have created sample elective pathways to help guide students to chose elective courses that best suit their goals. These samples are based on the courses that alumni have taken and the jobs they achieved after graduation. These include a Cartographic Editor for National Geographic, a GIS Specialist for Apple, Inc., a Masters of Science Student at UCLA, and a Scientist for the Bureau of Reclamation. A blank map will allow you to brainstorm your career goals and make your own map, with the help of an advisor. To ADD the SDS major, fill out this interactive form. To DROP the SDS major, fill out this interactive form. You can also ADD or DROP during an advising appointment with the advisor. New majors are strongly encouraged to make an appointment with the Geography and SDS advisor, Dr. Leslie McLees, through this online scheduler or contact her through email at geogadvr@uoregon.edu. 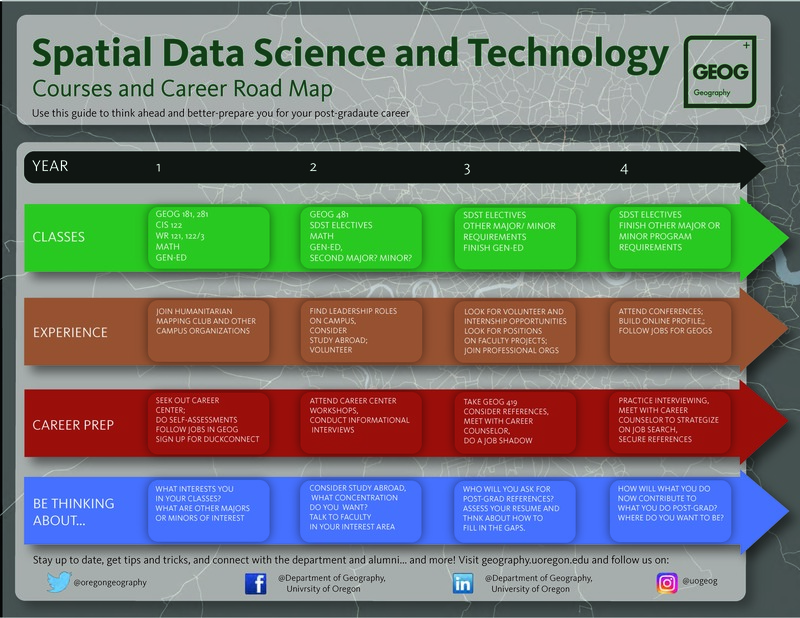 Spatial Data Science and Technology is well-suited to be combined with another major. At only 48 credits it can be completed within about two years along with other coursework. For example, you could double major in SDS and Geography for a total of 78 credits. However, SDS would also complement other interests and majors that you may have, including Computer Science, Planning and Public Policy Management, Environmental Studies, Earth Science, Journalism, Business, Anthropology, Biology, Sociology, Economics, and much more. Spatial Data Science and Technology major provides theoretical depth in spatial concepts and analysis in addition to the application of technology. Once you begin to understand the power of spatial data analysis, you will be able to combine that perspective to anything you want! For questions about how to fit SDS in with your academic and post-graduate goals, please contact Dr. Leslie McLees at geogadvr@uoregon.edu.